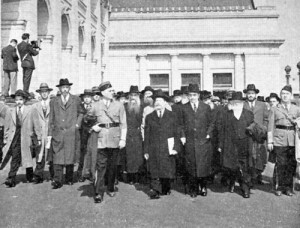 In October 1943 my great grandfather, Rabbi Eliezer Poupko marched with R’ Moshe Feinstein, Rabbi Eliezer Silver, and 400 other Rabbis to the White House to ask president Roosevelt to do more to help European Jews who were being massacred by the Nazis. Today, like then, the Iranians are threatening to destroy the Jewish people with their nuclear program. While we pray to Hashem to help save us from this devastation, it is important that we all do our hishtadlus. From following the American political systems closely I can say one thing is definite- your representatives care about what you think-especially if they know voting the wrong way may cost them their seat; calling the office of your Senators and Congressman, makes a major difference! Call your representatives today and let them know you care. Call Senator Corey Booker 202-224-3224 who does not oppose this deal yet and tell him to vote against this deal. Look up your local congressmen and tell them to stop a bad Iran deal! May the zchus of our teffilos and hishtadlus help protect Klal Yisroel wherever they are at all times.